Following the December meeting of Iowa’s Revenue Estimating Conference (REC), news outlets have reported that the state budget for the current fiscal year will have to be cut by approximately $100 million. However, if you read those reports carefully, you can see government double-speak at work. Newspapers, such as The Des Moines Register, reported that “A decline in projected state tax revenue will force $100 million in spending cuts for the current state fiscal year,” according to David Roederer, director of the Iowa Department of Management. Scrutinizing the report a little closer, you learn that tax receipts themselves haven’t declined, just the projected amount of INCREASED revenue has declined. In other words, revenue is still going up, just not by as much as the estimators thought it would. The incoming legislature now has to deal with a problem created by the previous legislature. Prior spending commitments, nearly to the maximum of what previous legislators thought the state would receive, will likely force current Senators and Representatives to make reductions because the revenue estimate proved to be overly-optimistic. This is a little like buying a new big-screen television with the surround-sound system for Christmas because you believe your boss is going to give you a hefty raise the following year or grandma is going to send you an even larger check as your gift this year. If the raise or the check turn out to be smaller than you thought, you find you have overspent your budget. Your “revenue” did go up, just not as much as you “projected” that it would, so you now find yourself in budget trouble. At the December REC meeting, the members scaled back their projection for FY17, but they are still estimating that tax receipts will rise from FY16 to FY17. Instead of tax receipts rising by $416 million, or 5 percent, the REC now says tax receipts will increase by $304 million, or 4 percent, necessitating the budget cuts of $100 million. Iowa isn’t receiving less money this fiscal year, it is spending too much! 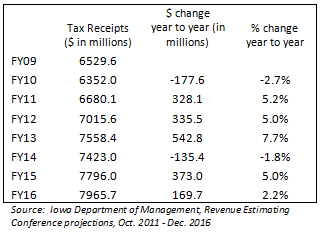 The chart below shows how much, in dollars, state tax receipts grew or declined, and the percent change in each year. The goal for a prudent state government fiscal plan should not be to spend all of the anticipated (but not received) additional revenue, but rather leave a cushion, adding funds to the rainy day account or some other savings account if we do in fact end up with surplus revenue. Prudent fiscal planning allows our elected officials to make the right fiscal choices for you and all Iowans if the REC estimates change. Iowans will now pay 6% sales tax on Amazon purchases. A change to collective bargaining in Iowa would allow comparisons between public and private compensation. Branstad won’t recommend tax cut. Thumbs up to Senator Bill Dix and the Iowa Senate for pushing permanent protection of Iowa’s budget with a 99% percent spending limitation of available tax revenue.